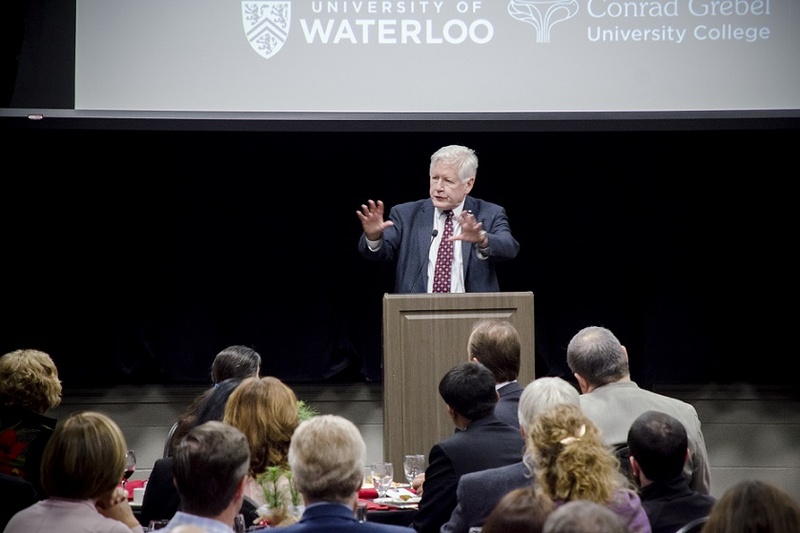 In celebration of the 40th anniversary of Peace and Conflict Studies (PACS), on April 20 Conrad Grebel University College hosted a sold-out gala dinner featuring Bob Rae, a former Ontario premier, as keynote speaker. Focusing on the theme of “Pursuing peace: stories from home and abroad,” the evening included alumni stories, acknowledgements of those who have influenced the PACS program, as well as Rae’s reflections on the pursuit of peace. Grebel President Marcus Shantz introduced Rae, a friend and former colleague in law. “Bob once wrote, ‘I believe in community and in finding ways to affirm community in the heart of a world in turmoil and fragments,’” Shantz said. The gala raised in excess $26,000 for the Master of Peace and Conflict Studies (MPACS) Student Support Fund.